From Hogarth through to Gillray and Cruikshank, it was Georgian England that gave rise to a graphic tradition of satire. The powerful were lampooned and the pretensions and avarice of the upper and aspiring classes duly ridiculed. But the poor did not escape moral censure. Far from it. Then as now we had the virtuous and the feckless poor, and it was the love of gin that often bought the latter down. But as biting caricature in England waned, giving way to the more genteel illustrations of the Victorian era, one figure in France was to dominate the form: Honoré Daumier, whom Baudelaire – that champion of French 19th-century modernism – compared to a pictorial Balzac. Like Hogarth, though rather more so, Daumier came from an impoverished background but he lacked the Englishman’s conservative tendencies. 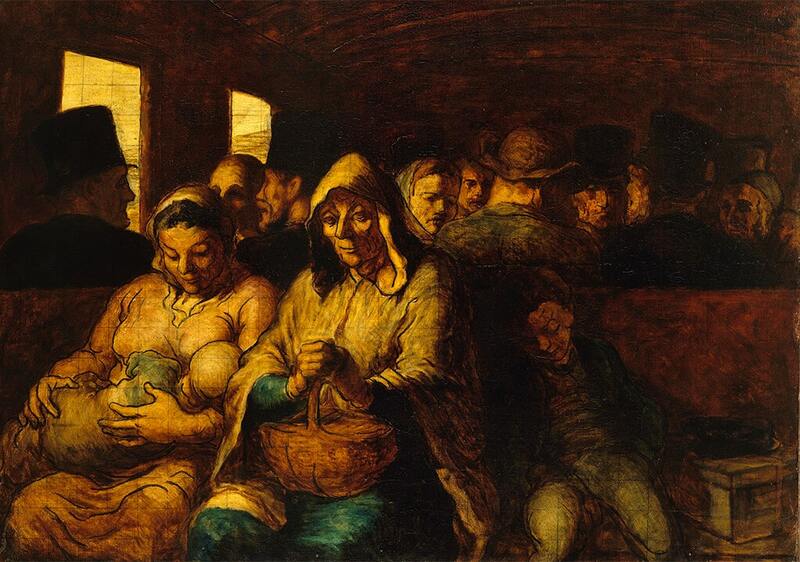 A staunch Republican in post-Napoleonic France, Daumier attacked the powerful, but also championed the poor. And he paid a price for it. For one particularly scurrilous lithograph he was imprisoned for six months. The print in question, which appeared in Charles Philipon’s satirical journal La Caricature in 1831, depicts King Louis-Philippe as Gargantua, hungrily consuming sacks of money through a gaping mouth from which a long ramp descends. Up the ramp, ranks of the labouring poor carry the cash-filled sacks on bent backs. Daumier spent a lifetime as a caricaturist. But after that episode his illustrations grew more subtle as censorship laws (after initial liberalisation) were once again tightened. He produced around 4000 lithographs in all, so the Royal Academy’s wonderful exhibition only contains a fraction. Here is the infamousGargantua, as well as a remarkable lithograph of François Guizot, the king’s interior minister, who Victor Hugo once said reminded him of “an honest woman running a brothel”. Through his awkward demeanour and meditative gaze, Daumier captures complexity and contradiction, while still managing to make Guizot look like a crook. 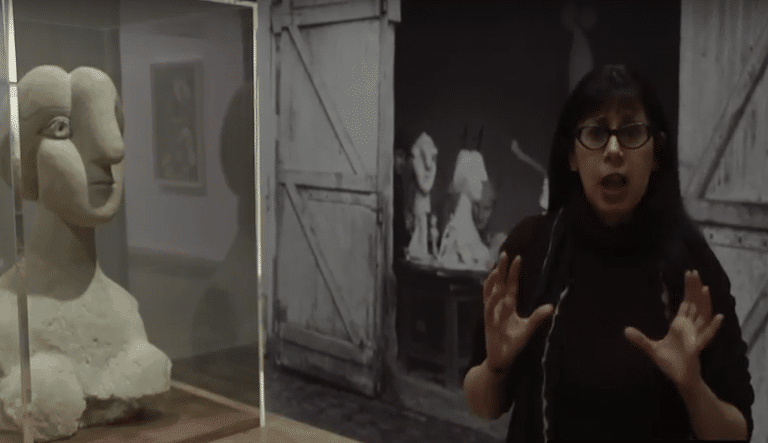 The exhibition gives equal weight to Daumier’s paintings, emphasising the fact that he was part of an artistic milieu in Paris, even though his paintings were little known and rarely exhibited after initial success at the official Salon. The exhibition begins with a shadowy and exquisite little painting by Corot of Daumier working in his studio, painted in 1864, and quotes Baudelaire’s claim that Daumier was one of the most important men “in the whole of modern art”. Certainly later artists tended to agree, with the greatest draughtsmen among them, Degas and Picasso, not only admiring his extraordinary facility as a graphic artist but admiring his focus on realist subject matter. The paintings are a departure from the more allegorical commissioned prints. Daumier assiduously observed working people submerged in daily chores and routines before painting them from memory in his studio. Paintings such as The Third-Class Railway Carriage, 1862-64 (pictured), exude great empathy. 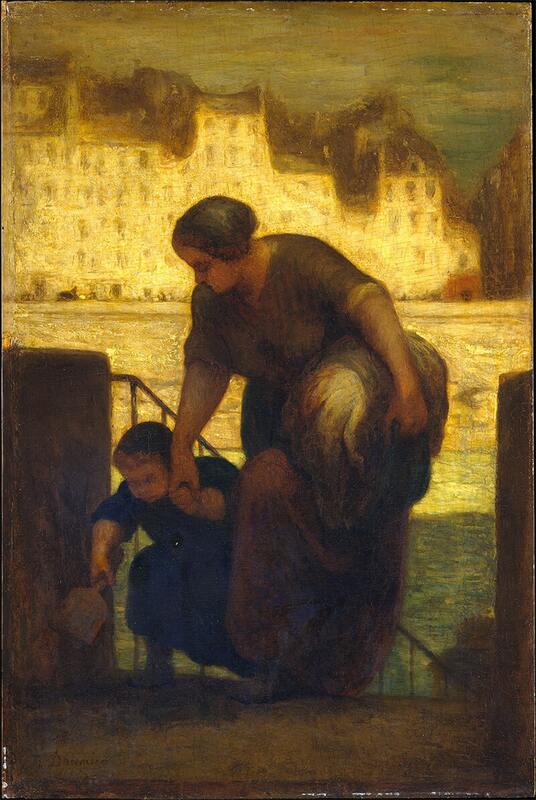 And one can almost feel the weight of the laundress’s burden in a series of sketchy paintings that feature a young woman heaving her load while leaning into the wind as she makes her way down a street with a young child in tow. There is something beguiling, as well as rather mysterious, about his paintings, since many were left unfinished, abandoned, including Man on a Rope, c.1858-60. Is this shadowy figure an acrobat, a labourer, an escapee from a crime scene? And what is his gaze fixed upon as he dangles from the rope – the dangerous drop, or a gawping crowd? We have little to go on, but what really captures the modern imagination is the unfinished immediacy of the rough-hewn paint. Similarly, the ghost of the figure of Don Quixote Reading, c.1865-67 seated in a dark and bare room, observed by one, possibly two indistinct figures in a doorway. Fascinating too, are the hand-sized busts modelled in clay, which Daumier made to assist him with his lithographs. These are of prominent figures in Louis-Philippe’s government, and their comically exaggerated features are finely and delicately rendered. Here is one with his head leaning to one side, appearing placid and reasonable, weighing up this and that; beside him is another who is stout and ruddy of face, bullish and uncompromising; and there another whose face is raised to the heavens, his eyes like a new-born kitten’s and with a childlike smile playing on withered lips, suggesting either dementia or someone with his head in the clouds and trying to reason with the angels.